Special thanks to Pace Gallery. What thy were about, Agnes Martin would never quite say. Up close, their surface resolves in iterated lines that skim or settle into the canvas’s tooth; at mid-distance, their right-angled spread becomes a quivering moiré; a few steps further back and their flutter freezes in an aquarelle plane. Abstract nouns like “beauty,” “perfection,” “surrender,” “happiness,” and “freedom” thread through the artist’s sibylline statements, which less cohere than uneasily coexist, hinting at a grand, overarching significance while never settling on a singular meaning. Theirs is a cadenced, continual slide between opposed poles: flickering and stable, hazy and material, congested and spare. 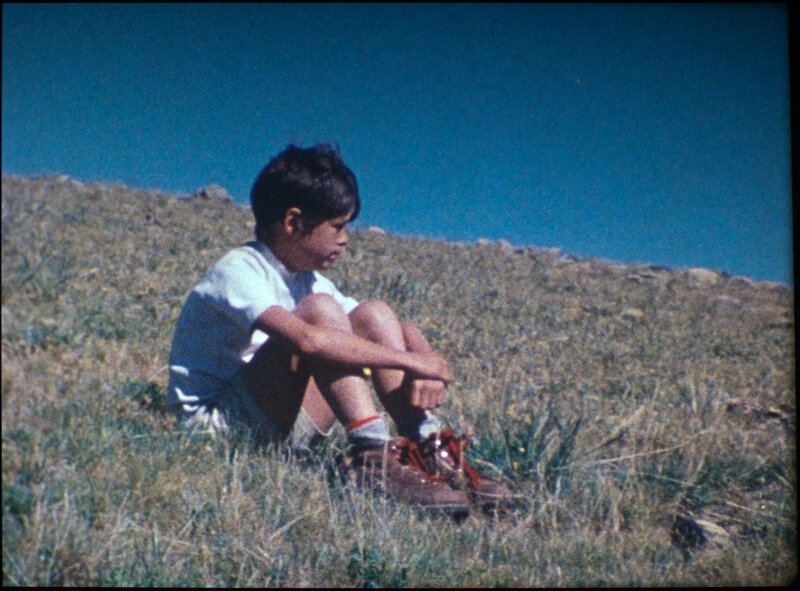 Gabriel follows its titular protagonist, a ten-year-old boy who lived near Martin on the mesa, as he ambles through an untouched landscape of hushed meadows and softly banked streams. A picturesque vista of purple-gray mountains furnishes its opening shot. The camera’s frame is fixed but ever so shaky, betraying the presence of Martin’s hand behind its lens. Cut to a medium shot of water swelling and ebbing along a pebbled shore at a legato lilt. The title intervenes atop a stretch of sand, then Gabriel appears before the Pacific Ocean, perfectly still, his back turned to the camera. Sand, water, and sky divide the frame into six stretches of color: mauve, dimmed purple, spumy white, slate, turquoise, and slate again. Bach’s Goldberg aria plays, its notes pleasantly trilled by the record player’s needle. Motion slows, the air wafts: a perfectly lovely day. 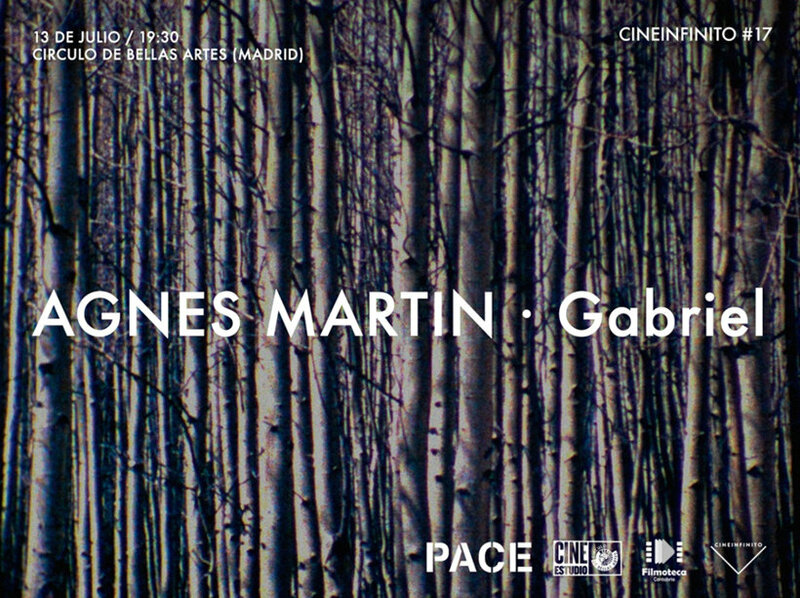 For the film’s remaining seventy-odd minutes, Martin’s camera loosely observes Gabriel’s hike. His journey appears in fragments—here he advances up a hill, there he idles in a grove—interspersed with fleet shots of nature (flowers ruffled by the breeze, lily pads patterning a pond) that fail to cohere in space or in time. In a recurring sequence, Martin cuts between various views of flowing water, each held long enough to arrest our gaze without letting it linger. Purling streams and sun-specked riverbeds appear in swift succession, each a non sequitur to the image that precedes. Martin approaches these shots as she might a painting, her fixed framing recalling the obdurate dimensions of her signature six-foot-square canvases. 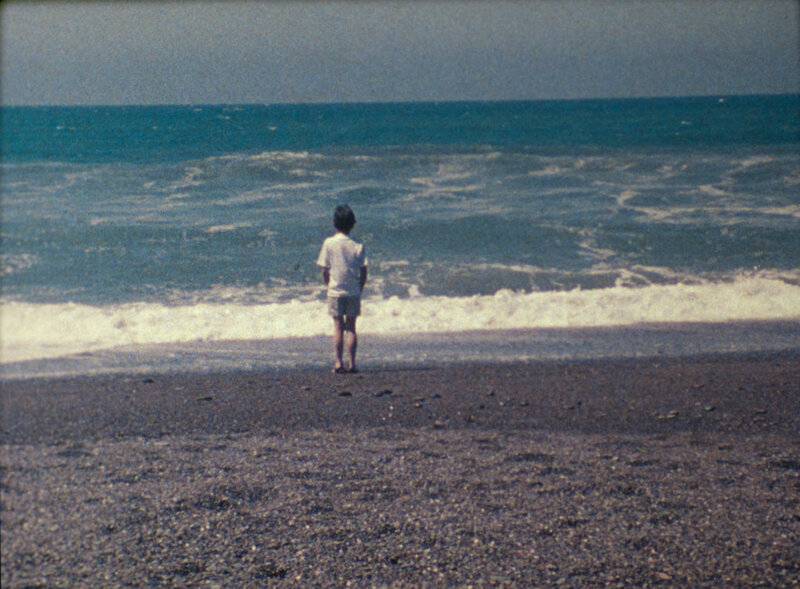 (Tellingly, at Gabriel’s close, she credits herself not with direction but with “camera composition.”) At moments, she films in slight unfocus, abstracting tussling waves into a turquoise haze. Such effects seem less nurtured than accidental. For an artist who thought in graphite and gouache, the camera must have seemed a foreign object, and Martin handles it awkwardly. As Gabriel traverses the frame, she zooms in, then rapidly retracts the camera’s focus, as if unsure how best to render movement in a space removed from the canvas’s plane. While point of view shots occasionally intrude—the boy looks skyward and a single wispy cloud fills the frame—Gabriel’s economy remains doggedly external: a translation to celluloid of Martin’s desire to make painting “as unsubjective as possible.” While she lavishes nature with repeated close-ups, Gabriel’s face is never privileged with the same. Martin prefers to capture him from behind, her camera steady as he recedes. No motive is offered for his hike, and he expresses little, if any, emotion, doing no more than impassively, dutifully walking—often, it seems, at Martin’s express command. Sketched in the vaguest of contours, Gabriel becomes a symbol: “innocence,” writ large. His ruminative detachment suggests an “untroubled mind,” that vacant yet focused state which Martin so exalted, and which she associated with children. “Classicists are people that look out with their back to the world,” Martin averred in a series of statements published in 1972. Her words summed the tradition with which she insistently identified her art. Yet, while Martin aligned classicism with the exultant emotions elicited by nature, she denied that her canvases were abstracted landscapes—mappings of the fields of her father’s wheat farm or the fluent flats of the Southwest. Never mind her suggestive titling (White Flower, Falling Blue, Leaf in the Wind), or her intimation of the grid’s connection with the plain. Recall the shot of Gabriel stilled at the water’s edge, and you’ll see the bands of muted color that characterize Martin’s paintings from the mid-1970s onward. “It is not a work Martin herself gives any indication of wanting to bracket away from the rest of her art. Yet it should be,” Rosalind Krauss cautioned in her catalogue essay for the artist’s 1992 Whitney retrospective. Her fear was that Gabriel would congeal Martin’s grids as “crypto-landscape[s],” the subtleties of their facture lost in the drive to identify this field or that parched expanse. Krauss wanted to claim Martin as a modernist of the classical sort, her paintings an inquiry into the objective ground and subjective experience of perception. Yet, while Gabriel does not concern vision in the abstract, it does deal with a certain perceptual attitude: “a patience to look and look again,” as photographer Zoe Leonard described. It is that same sensitive, iterative gaze that so defined Martin’s paintings. Faced with Gabriel’s nature montage, one cannot help but see Martin behind the lens, her hand lightly trembling as it did when she drew graphite across canvas.